Lisa, I have the circles stencil that you mentioned at about 1:15 to 1:25 into your video. It's Plaid Folk Art painting stencil #30590. I don't think it has a name. I also highly recommend product #30599, which is a flower stencil that I've used a lot. 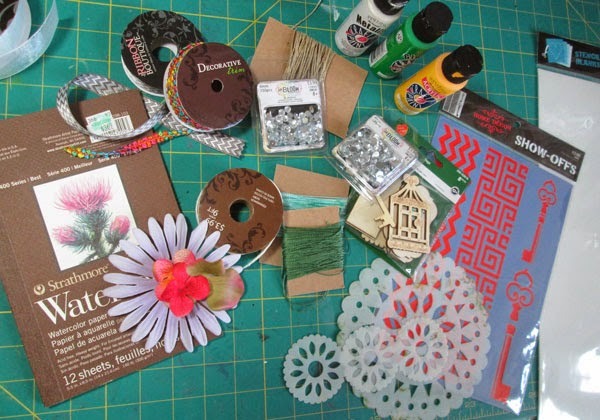 I think this topic would make an excellent class for scrapbooking or mixed media. There are so many items at places other than craft stores - and even some that are laying around the house for free! The world is full of possibilities. Thanks for sharing! Thank you for the numbers. I'll definitely check out the flower stencil on my next trip to Michaels. Hey Lisa! To get the newsletter we sign up for the mailing list? Found you after this months scrapinar-you packed some great content into this video. Thank you! I would love to know what cut settings you use with you silhouette and the stencil material. Also, do you have the silhouette stamp material? I have the hardest time with it- would love to hear your thoughts! Thanks again! Yes, sign up for the mailing list at the top of the blog sidebar. To cut stencil material on the Silhouette I use the Rhinestone setting and I think the blade is at 6 for that. Works great! I don't have the stamp materials. Kristina Werner did a video on it a few months ago at kwernerdesign.com . I had actually forgotten all about that feature. It didn't look that easy to work with to tell the truth. Anyway, thanks so much for your comments about the Scrapinar. I like to get a lot into my video time. I enjoy finding treasures in other parts of the store as well as other stores, like the hardware store or the dollar store.